Pool D, much like Pool A, moved along relatively quietly today. Johnny Bravo cruised as the most convincing championship contender alongside Revolver and, aside from a Chain Lightning upset over Machine, the remainder of the pool went entirely to seed. 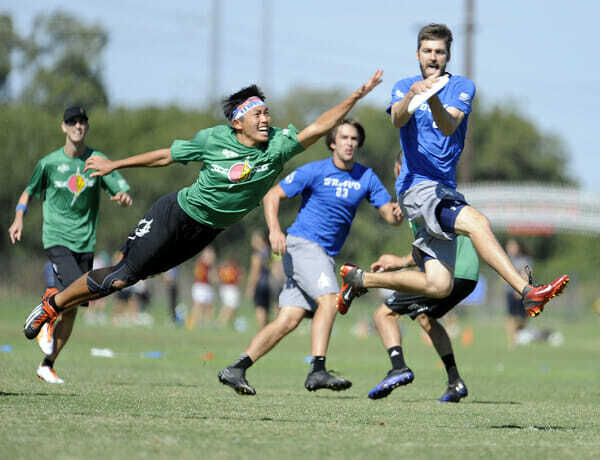 On the Ultiworld showcase field, Chain and Johnny Bravo met up in a game that was about as different as night and day at different points during the game. Atlanta came out hot, capitalizing on Bravo mistakes and playing mistake free on its own in order to take a 6-4 lead. However, that would not last long as some of Atlanta’s classic mistakes came back to bite it and Denver rattled off 4 straight scores to take half 8-6. The bleeding didn’t stop there though. Johnny Bravo’s defense continued to apply pressure and its offense continued to slice through Chain’s defensive looks, especially with Jimmy Mickle throwing and catching scores all over the field, and Denver extended its lead to 13-9. From there, the two teams traded out to give Bravo a 15-11 victory. Across the pool, Machine looked up to its regular season ranking by putting a pretty large beating on fourth seed Furious George with a 15-8 lopsided victory. Machine and Chain faced off in an important 2v3 game that saw Machine jump out early to a 5-3 lead. However, Atlanta managed to do what it could not do against Johnny Bravo and stage a comeback. According to Chain captain Mark Poole, his team was able to flip a switch they’ve been lacking all season and apply pressure and intensity to a team in front of them. Slowly but surely Chain chipped away at Machine’s lead and took a 9-8 lead. Over the course of the rest of the game, Atlanta would maintain and extend the lead to earn a 15-13 win. Machine was frustrated with its execution errors throughout the game according to captain Craig Poeppleman. Though the game didn’t turn out the way that Chicago had hoped, Poeppleman insisted that Machine only needed to run its sets and execute in order to give Bravo a run for its money in the 4v5 overall game. Meanwhile, Furious’ day did not get any easier as Bravo rode its momentum from its win over Atlanta and jumped out to a 4-0 lead. Denver wouldn’t stop there and won by a final count of 15-7 over a now reeling Vancouver squad. In round three, Furious collected itself and made a run at what it considered to be its most winnable game. For this game, one should best read the recap on Furious’ website to understand the tone and nature of the game. Furious tightened its lines and truly attempted to challenge Chain. Unfortunately for the Monkey, Chain leaned on its deep game — what it knows best — and made consistent athletic plays to earn and hold a slim lead that led to a 15-12 win. While Machine thought that execution was the only difference in winning and losing against Chain and against Bravo, Denver proved otherwise. Johnny Bravo proved they were in a class of their own in the pool by taking down the two seed 15-7. Bravo’s defensive line, lead by Nick Lance, Eric Johnson, and several other stand-bys, put pressure on opponents all day long and Machine was no exception. Bravo rides this win into Friday as one of the hottest teams at the tournament. Additional reporting by Austin Weaver. Comments on "Pool D Recap: Men’s Division"